Max Verstappen came in for a lot of criticism after the Chinese Grand Prix, where two incidents in the space of four laps took him out of contention for the victory in Shanghai, while at the same time also causing serious damage to Sebastian Vettel's chances to increase his championship lead over Lewis Hamilton. Typically, the young Dutchman felt the criticism was unjustified and vowed to remain faithful to his attacking style, but hopefully those around him, from Red Bull and his own management team, will make him come to his senses quickly, still in time to keep Verstappen in the fight for a championship that could turn out to be a fantastic six-way battle - or five-way, if you are inclined to believe Ferrari decided to put all its eggs in one basket even before the SF71H had turned a wheel in Melbourne. It was Verstappen's attacking style that caught everyone's attention very early in his Formula One career. Right here in Shanghai, only on his second Grand Prix start, he surprised some of his midfield rivals with his ability to change direction under braking for the hairpin, catching them unaware and giving no chance to close the door without causing an accident. His ability to brake late, steer into the inside under heavy braking and still make the rear of his Toro Rosso rotate enough to make the corner were the talk of the vast Shanghai paddock at the end of that race, and for the two following seasons we saw more of that, most of the time to great effect. This year, though, Verstappen's "maximum attack" style hasn't really paid off and in just three Grand Prix weekends he made six costly mistakes, five of them in the races. In Australia, desperate to get past the fast-starting Haas-Ferrari of Kevin Magnussen, the Dutchman went wide on the exit of the very fast Turn 12, damaging the underside of his Red Bull with immediate loss of downforce. Undeterred, Versttapen continued on the attack, only to spin in Turn One, dropping a few places and finishing the race in a lowly sixth place, behind the much slower McLaren-Renault of Fernando Alonso and more than 20s behind team mate Daniel Ricciardo. Two weeks later in Bahrain the young Dutchman threw it away in Q2, hitting the wall on the exit of Turn 2 and although it took one week for Red Bull to clarify what had really happened, it looks like Verstappen's foot moved from the throttle when he went violently over a kerb, causing the loss of control of the car. Starting from 15th on the grid he then clashed with Hamilton at the start of lap 2, when he decided to leave no space for the World Champion to stay on track after doing a clean move to pass him under braking for Turn One. You see, doing something like that to a midfield driver, or even a top driver who doesn't have a very secure position in his team, tends to work as they'll do almost anything to avoid an accident; doing it to a top driver that has the full backing of his team and a status within the sport that will protect him from a lot of criticism, is a different one. Of course Hamilton could have lifted or gone wide to avoid the accident, but why would he? That would just be inviting Verstappen to do it again and that was something the Mercedes driver was simply not going to have. The inevitable puncture eventually led to Verstappen's early retirement and fortunately for him Renault accounted for Ricciardo, who also retired early in Bahrain. One week later, and after a wild off at the last corner one hour into FP1 - these things happen when you're pushing hard - Verstappen then found himself in a position to win the race after Red Bull made the inspired call of using the Safety Car period to switch both its drivers to Soft tyres for the final 20 laps of the race. The two Mercedes and Vettel were in front, but the RB14's pace was much higher, so getting past them was just going to be a matter of time. But Verstappen faltered at the first hurdle, in the form of Lewis Hamilton. 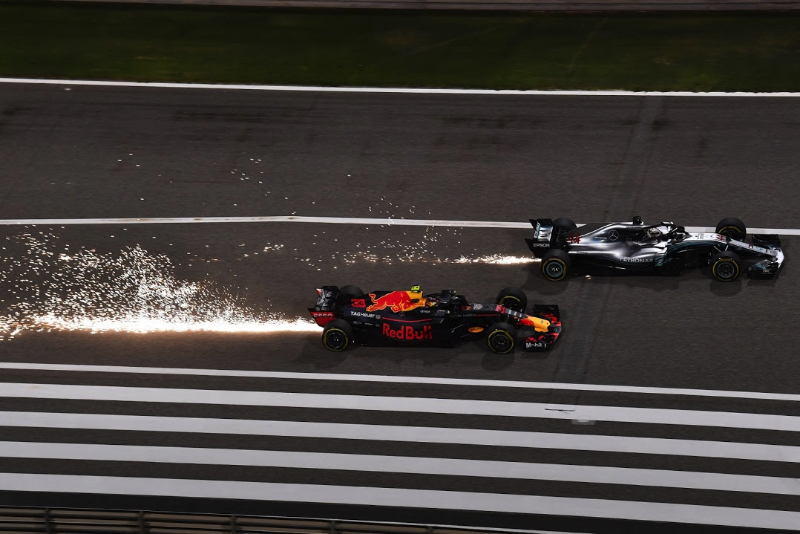 The two had exchanged a few words on Thursday in Shanghai and seemed to have no issue with each other, only for the Red Bull driver to then say, "he blamed me because it's easier to blame the younger guy", so there was a bit of heat to clear between the two. By trying to go around the outside of the W09 on Turn 7, Verstappen was looking for trouble and certainly got it. After the race Hamilton claimed he hadn't even seen the Red Bull in that instance and insisted, "you don't pass a top driver around the outside on that corner", but his car had a very convenient wobble when the Red Bull started to draw alongside, instigating a quick reaction from Verstappen that took him into the run-off area, losing a crucial position to Ricciardo. To rub it in, the Australian then passed Hamilton one lap later, with a very late move into the hairpin, right in front of Max's eyes. After eventually clearing the Mercedes driver, seconds before Ricciardo passed Vettel, the Dutchman set off after the Ferrari driver but completely misjudged his move going into the hairpin, crashed into the red car causing a double spin. The inevitable 10-second penalty cost another position, so while Ricciardo scored a sensational victory and moved up to 37 points in the championship, Verstappen finished 5th and lies down in 8th in the championship with only 18 points to his name. And while Mercedes and Ferrari are separated by just one point in the Constructors' Championship, Red Bull is already 30 points behind the Silver Arrows , partly because of Ricciardo's engine failure in Bahrain, but mostly because of Verstappen's mistakes. And that's something Christian Horner and Helmut Marko are acutely aware of, so they will be taking measures to make sure such mistakes are not repeated anytime soon. Of course it would be a shame if Verstappen were coerced to change his approach in a radical way, because his attacking style is in his DNA and one of the reasons he's one of the most exciting Formula One drivers to watch. But it seems clear the Dutchman has to back down a notch in his approach to close racing, because there is a fine line between being on the edge versus going over it. The late, great Ayrton Senna also started off his Formula One career by frequently going over the edge but as soon as he got his hands on a championship winning car he dialed down his aggressiveness without losing his speed and won three World Championships in four years. Others, like Stefan Bellof and Gilles Villeneuve were also phenomenal attacking drivers but, unfortunately never got the chance to take a slightly more cautious approach, although it seemed the Canadian was on his way to do it, such was the pace of his 1982 Ferrari, when he was taken away from us in Zolder. To win championships you have to finish as many races as possible without losing points in an unnecessary way; and to battle with top drivers you have to respect them and give them a bit more room than what you'd give a lesser driver or when you were fighting merely for points and not for wins. Until the end of last year Verstappen got away with moves on Hamilton or Vettel because they were fighting for the title and he wasn't, so they'd rather let him through than crash and lose valuable points to someone who was not a threat to their main target. But this year Red Bull may have a championship-winning car, so the goal posts have changed and Verstappen no longer has a free card to bully his rivals out of the way. Understanding that as quickly as possible will be the key for the young Dutchman to remain in the title battle for as long as his RB14 will allow him; failure to grasp the new reality will just bring more aggravation - and penalties - coming Verstappen's way.